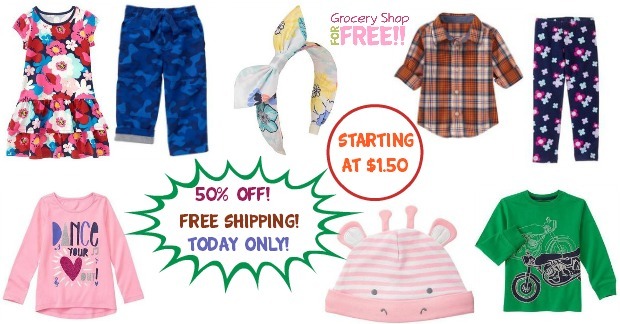 Kids Clothes 50% Off PLUS FREE Shipping! Prices Starting At Just $1.50! You are here: Home / Great Deals / Kids Clothes 50% Off PLUS FREE Shipping! Prices Starting At Just $1.50! Gymboree is having a nice sale today! You can get 50% off clearance items PLUS FREE shipping TODAY ONLY! Prices start at just $1.50! They also have 40% off regularly priced items, too! So, there are deals to be had today! Remember it’s good TODAY ONLY!